HOT DEALS: Teufel announces pre-Christmas price cuts | What Hi-Fi? The Teufel Kompakt 30 5.1 home ciinema package is slashed from £180 to £135. 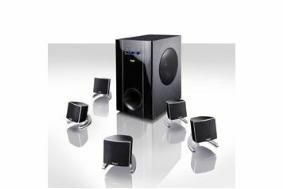 It consists of four compact satellite speakers, a micro centre channel speaker and a small subwoofer. The Teufel Concept E was £162 and can now be had for £115. It's a 5.1 multimedia system designed for use with your PC. And finally the Teufel iClock stereo iPod dock/alarm clock drops from £90 to £62. All Teufel speakers come with a 12-year guarantee, and there's a two-year warranty on amplifiers and electrical components. These and other discount offers are available exclusively on Teufel's website. And for more Christmas gift ideas, check out www.teufel.eu/gift-ideas.